With all the things going on around my house and yard right now, stitching time is at a premium! I need to tuck in a little more time for it as I'm in three round robins right now, one of which is just finishing up. This block is Kathy Semone's block for the Hearts DYB. She hopes to use her blocks in place-mats, so I opted to do all the embellishment with cotton embroidery threads and pearl cotton which will wash well. French knots and bullion stitches take the place of beads and some embroidery thread spider roses take the place of silk ribbon embroidery. I'm happy with how it turned out and hope that Kathy likes it too! 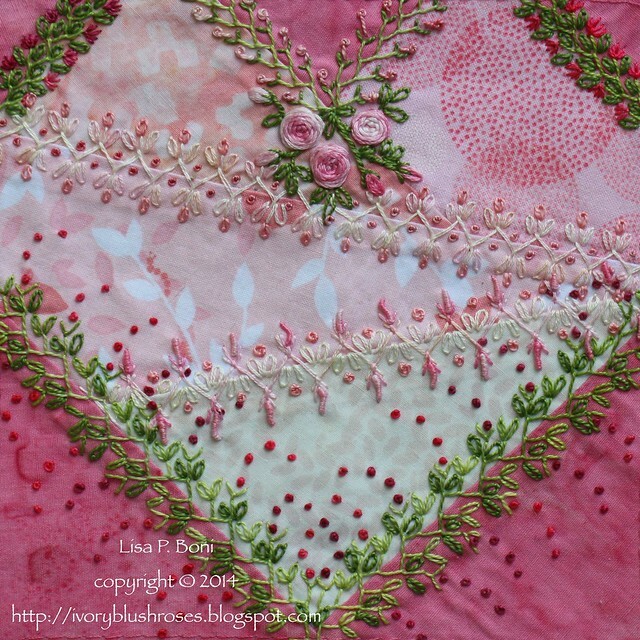 Next up in the Hearts DYB is this lovely block from Barbara! She wants the heart outlined in black somehow and the rest of the block to be done in flowers to coordinate with some other blocks she has. I love the fabrics in this and have lots of ideas for it! 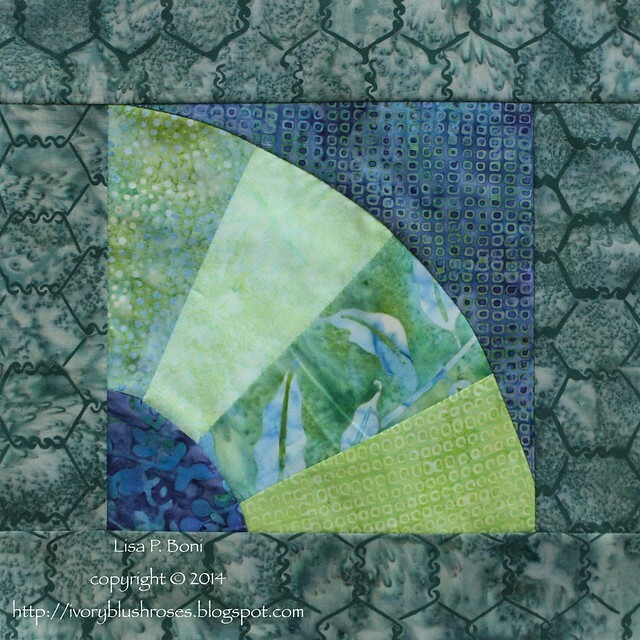 The next block in the Fans DYB is this lovely block from Thearica. She is asking for jungle themed colors and motifs. The previous finished blocks are gorgeous, so I have quite a task to get this one up to the same level of work! I think a tropical hummingbird will be alighting on this block! I have an Under the Sea block in progress for Velia, which I'm not quite ready to show just yet. But the next one arrived in the mail a few days ago. This is Ola's block. 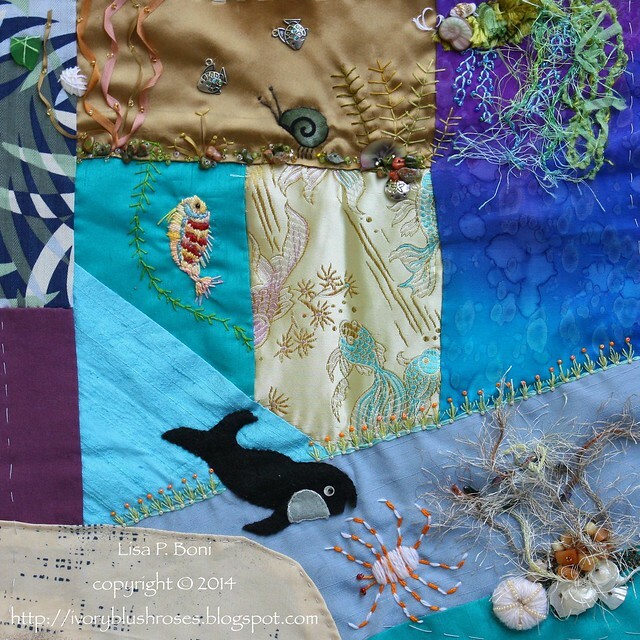 There is a lot taking place here, and some lovely work. But the focus is all over the place, so I'm not sure just how I'm going to approach this one. I have it pinned up so I can muse on it for a while. I need to find a way to bring the block into a cohesive whole as I am the last to work on it. I suspect there will be lots of seam work since very little has been done so far. Yesterday was a glorious day! 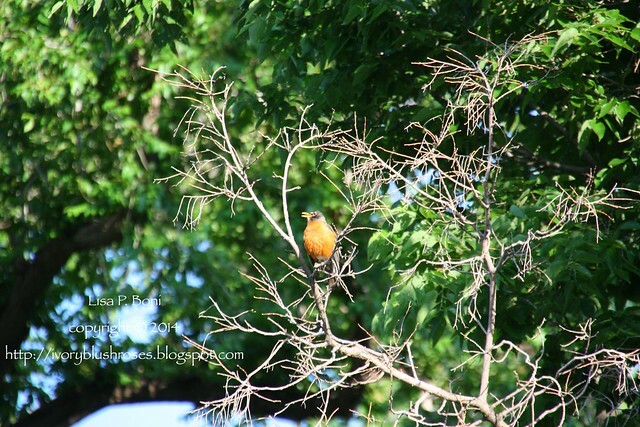 I was up with the sun ~ well, actually before the sun, but the sky was already getting light at 4:00 a.m. As the sun rose, this robin sat in the tree and sang his heart out for over two hours! He was accompanied by the cooing of the doves. What a perfect greeting for a beautiful day! 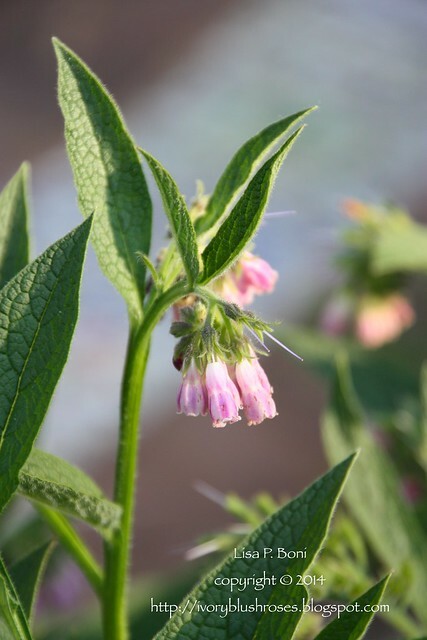 An early morning walk around the yard revealed these beautiful bells on the comfrey! It's just been amazing this year! I also took stock of all the projects I hope to finish this weekend! First, there is the arbor that my youngest son Zach and I have been working on. We got rained out on this and had to stop. Hope to get it finished and up today! Next up is to finish placing all the landscape beams. 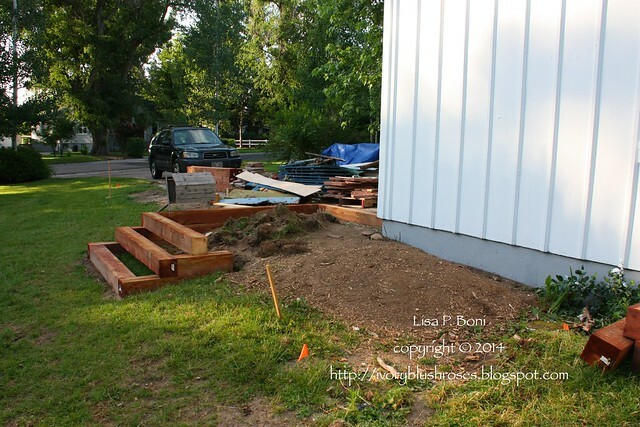 My garbage cans will sit on an extension of this area and on the far side will be another planting bed where I will plant some lilac bushes, which my yard is sadly devoid of. We hope to finish the beams placement today. 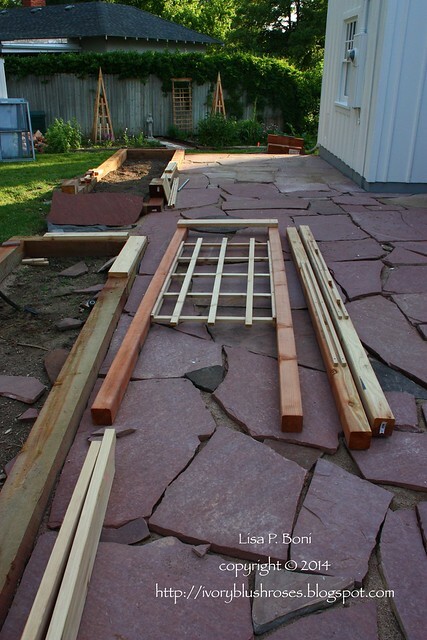 Later today, the rest of the sand and soil arrive so I can finally get planting and finish laying the flagstone! 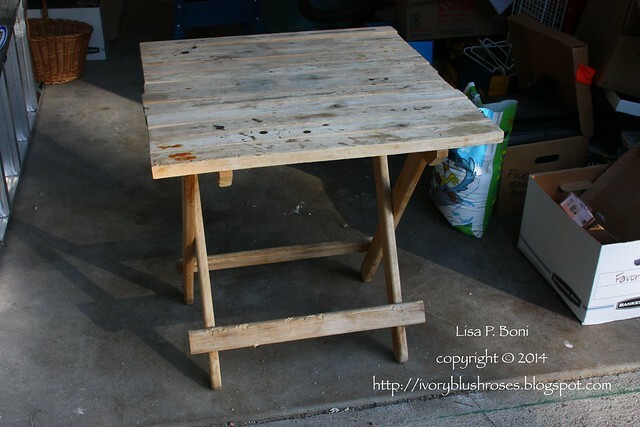 This little rustic table has been on my porch and I've wanted to paint it for a long time. I got the first coat on yesterday and hope to get the second coat on today! It will look so much better against my freshly painted house! 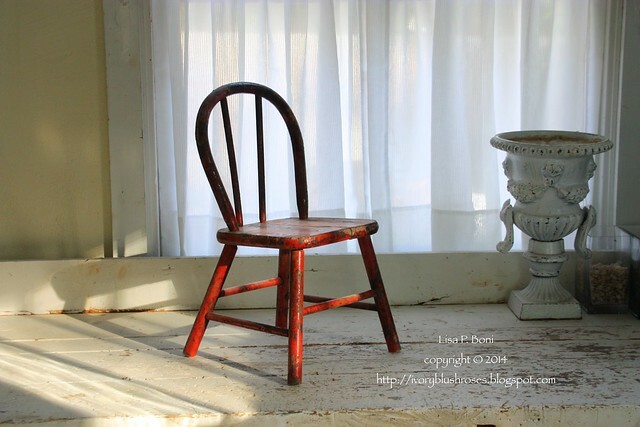 Another project I want to finish this weekend is the repainting of this little chair. When I was a little girl, I had two of these and my kids used them as well. We lost one in our house fire in 1999, but I was able to salvage this one. It's a little worse for wear, a bit smokey smelling and sooty despite having been cleaned. It needs re-glued once I get the paint scraped off. I've got the paint about half scraped and hope to finish this and get it painted white this weekend. Did you notice the surface where the chair is sitting? After not being able to hardly walk through the garage for most of the time I've lived here, I finally got it cleaned, organized and mostly painted! My goal has been to downsize much of the stuff that was out here and get it to the point that I can park my car in here, especially during cold weather. A few weeks ago, my daughter hauled off a huge pile of stuff to Goodwill. Then when the insulation crew was here, we had to empty it out so they could work on it. It was a good excuse to get it in shape! Most of it is painted, and my youngest son Zach will finish up the high trimming and the wall above the shelf at a later date. But it looks so much better! We still have quite a pile of empty boxes at the front, for my daughter to use when she moves out, but for the first time since I've lived here, there really is hope of being able to park in the garage! 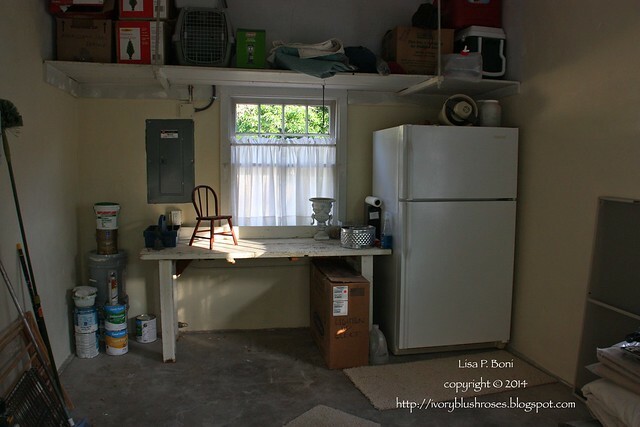 With all those projects to work on, I'd better stop here and get to work! Have a wonderful weekend! I love seeing all of your projects, it inspires me to work on things too. Can't wait to see your lovely gardens and new craft pieces. Thank you for sharing! 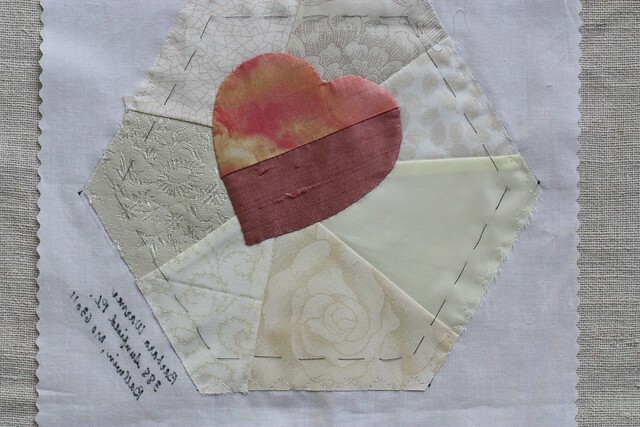 Kathy Semone's block for the Hearts DYB is the just stunning. I love the stitching and the roses, and the colors. It is just as amazing as you are. I so appreciate your sharing your work. I hope that one day I can be just half as good at CQ as you are Lisa.